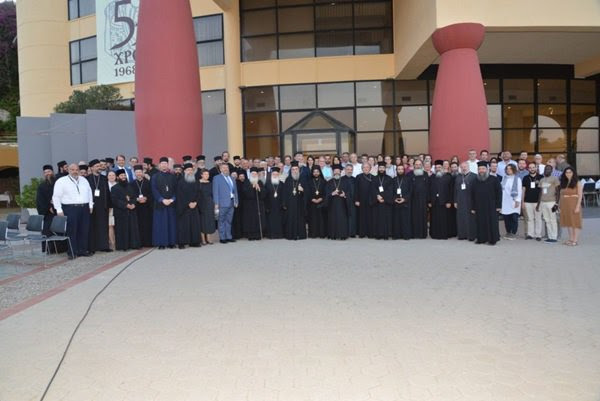 By God’s Grace, a fortnight has passed since the end of the 2nd International Conference on Digital Media and Orthodox Pastoral Care, which was held at the congenial conference centre of the Orthodox Academy of Crete, at Kolymbari, Hania, with the blessing of His All-Holiness the Ecumenical Patriarch Bartholomew II. The conference was hosted by Metropolitan Amphilochios of Kiasimos and Selinos. The centre and spiritual heart of the Conference was the Holy Altar of the venerable basilica of the Stavropegic Monastery of Our Lady the Guide, Gonia, where, every day, the head of the conference celebrated the Divine Eucharist, a sacrament of the Church and the centre of the spiritual existence of its shepherds. The guiding force behind this five-day spiritual feast was our revered and venerable Elder, the experienced helmsman of the Holy and Great Monastery of Vatopaidi, Archimandrite Efraim. There were limitless expression of gratitude to him from the 104 speakers at this most significant Conference for this most important experience. Although, as an Athonite monk and follower of the hesychast way of life which he inherited from his saintly spiritual forebear, Iosif the Hesychast and the blessed among monks Elder Iosif Vatopaidinos, Elder Efraim teaches us. His efforts are not confined to the assiduous brotherhood at Vatopaidi, but he also assists and benefits the people of God, not only in the Holy Spirit, but also materially, putting into action the saying of Saint Paul: ‘I have become all things to all people so that by all possible means I might save some’. He is always surprising us with his innovative initiatives, through which we learn not only about theological experiences, but also those of lay people which, as pastors, we need to learn in order to help struggling Christians in the 21st century, with all the electronic means of our era, to attain to sanctification and glorification. The meticulous papers by their Eminences the Metropolitans, the Holy Abbot of the Holy and Great Monastery of Vatopaidi, the holy fathers, the learned professors and other attendees, brought us up to date and forced us to think both positively and negatively about the use of digital media. Those taking part in the Conference, from 15 Orthodox countries all over the world, are involved in Church news dissemination on the Internet, and explained their experiences to the foregathered assembly. Moreover, the opportunity to mingle on a friendly basis with the more than 180 attendees was a communion in the Holy Spirit which made us happy and proud, in Christ and in the Orthodox faith, that we were able to enter into a fruitful exchange of views on this sensitive subject. 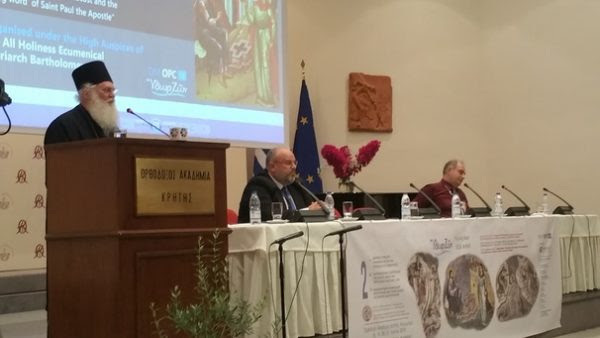 It would be an oversight not to express our warmest thanks also to the General Director of ‘Pemptousia’, Mr. Nikos Gouraros, as well as to the members of his executive staff, who were responsible for the organization of this entirely successful spiritual gathering. When using the Internet, we should all be well aware of the saying of the great niptic Father Saint Isaac the Syrian, that ‘Discretion is the greatest of the virtues’. Whether we use it as a tool and source for all kinds of information and learning, or as a way of pointlessly wasting our time, it is a reminder of the use of a knife. It can, for example, be used to cut bread, but it can also be used as a threat to life itself. By the same token, the use of the Internet can be of benefit to the soul through the reading of the Holy Scriptures, Patristic texts, spiritual works and reliable information about Church matters. It can, however, be catastrophic, especially for young persons who frequent the dark pathways of the Internet through harmful sites of all kinds, deifying themselves by their narcissism and self-regard and losing sight of their destination, which is salvation. But we must also look at the positive aspects of its use. The words of Professor Sotirios Despotis of the Theological School of the University of Athens are most apposite here. In his paper, entitled ‘Paul and the Ethics of the Internet in a Globalised World’, he mentions that Saint Paul sent epistles in the form of a folio his to spiritual children in the various local churches. The same can be done by the Orthodox Church and its shepherds by posting spiritual texts on the Internet, as well as empirical homilies and teachings, since a tablet or a portable computer is like one of Saint Paul’s folios. Even the light given off by a computer screen in use recalls the light emitted by the words of the Gospel. It follows that the Internet can be used as a pulpit in a church and as a way of providing information, in accordance with Saint Paul’s words to his disciple, Timothy ‘carry out your ministry fully’, with the aim of transmitting reliable and beneficial Church news to the modern world [A play on words by the author. At the time of Saint Paul, the Greek verb meant ‘carry out’, but now means ‘inform’. WJL]. There can be no doubt that the Internet cannot replace the living presence of a spiritual guide in the life of believers. It can, however, serve as a means of intermittent communication. The experience we acquired as shepherds of the Church of Christ, as well as the questions posed by the attendees will be of great assistance to us in our spiritual ministry. The announcement by Elder Efraim that the Holy and Great Monastery of Vatopaidi, in collaboration with the Internet channel ‘Pemptousia’, is to found a Pan-Orthodox site for reliable Church news was welcomed particularly warmly by those present. According to words of the Apostle of the Gentiles, Saint Paul, the Church calls upon us and challenges us to ‘test everything; hold fast to what is good; abstain from every form of evil’. We should not maintain a negative stance towards the advances of technology, but should use them as a means of transmitting the saving words of the Gospel, instructing the ‘light-formed children of the Church’ [2nd canon for Pentecost, ode 5] how to tell the truth from lies, light from darkness, virtue from sin, and spiritual profit from corruption of the soul, so that Christ and His message can be promoted in this constantly changing world. Holy Monastery of the Archangels, Asteri.